Home » Reviews » Camtasia 2018 Review: Is It Really Worth To Buy? 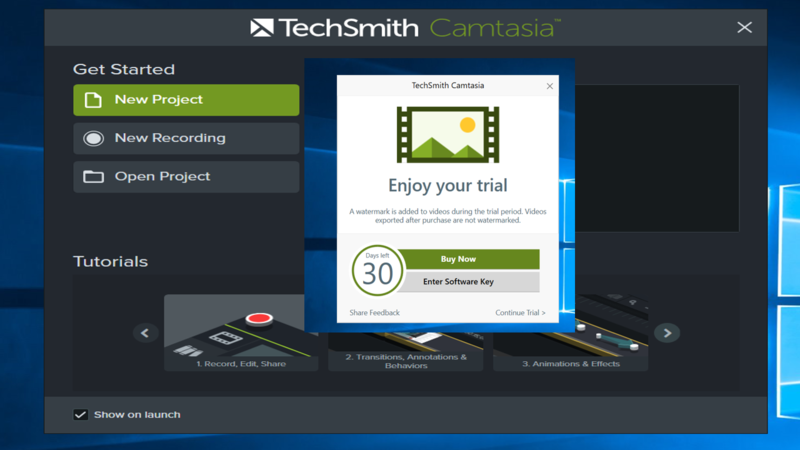 Camtasia 2018 is the latest version of TechSmith Camtasia, an all-in-one computer based program for creating screencast videos at professional level. The program comes in as an industry standard for screencasting, being trusted by millions of users all over the world. As an all-in-one desktop based program, Camtasia includes two main parts: Screen recorder and Video Editor. Both tools in Camtasia 2018 work perfectly during our test. We highly appreciate what the program can bring to you as professional video creators. However, the license price starts at $249 is comparably high compared to other similar software. In this review, we’ll help you uncover all the most important features of this program and tell you the reason why it worth to buy. First off, as professional reviewers, we have very limited time to test each program to discover everything about the software. However, we always try our best to every feature which we think it is important for you to know. We are 100% sure that all the others are also doing the same things. When a software can meet our review guidelines, we’ll publish our review about it on our site. We are honest reviewers, nobody can put words into our mouth to say good things about their software. It is the same story on all of our review. If they are good, then we will recommend you to use it. Otherwise, our bottom line will tell you the truth. How to get Camtasia 2018? 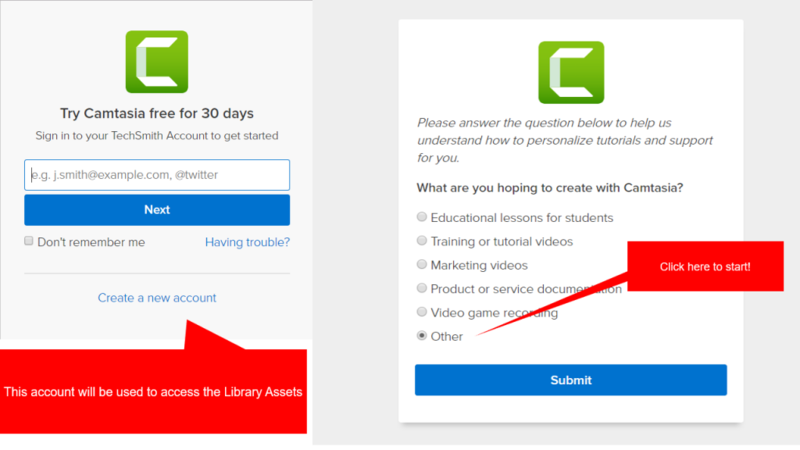 In order to get Camtasia for 30 days as trial, you’ll need to download the program with a register email and answer a simple question to tell them what’s your purpose of use. There is no credit card requirement at this step. This procedure is really simple. You don’t have to waste a lot of time on downloading it to your computer. Once you got the package, just a few more clicks before you can start your work. It will take about 5 minutes to install the program. When the installation is finished, you’ll receive a pop-up to remind that your trial period is now started. A watermark is added to videos during the trial period. Videos exported after are not watermarked. 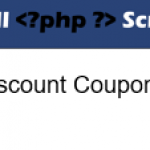 If you wish to buy the software, you can hit buy now or enter software key. 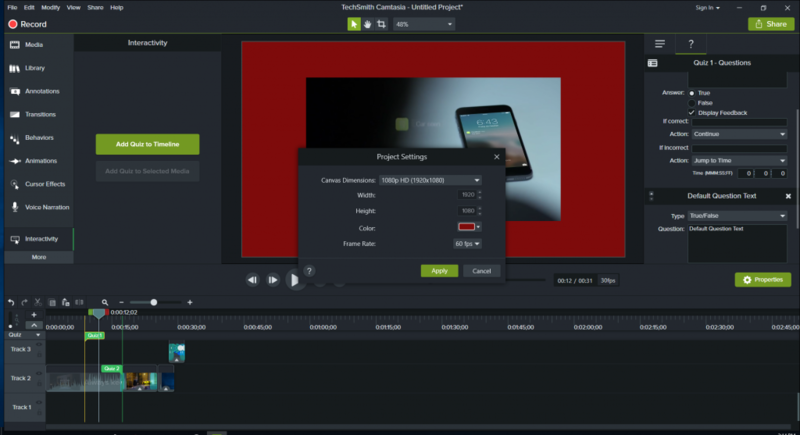 Camtasia impressed us from the very first moment of using it. Its starting screen is very simple to follow even you are new to Camtasia. You can choose to create a new project, open recent project or start a new recording. Like other professional software, Camtasia provides 10 useful tutorial videos for beginners on its starting screen. These are good resources for you to understand how to work with it at the first time. But in our opinion, you’ll able to learn all the features of Camtasia after a few projects for sure. It has a smart and intuitive workflow that anyone can overcome the learning curve within a short time. How to work with Camtasia? How the screen recorder and video editor work? When writing review about a program, we often spend more time to learn how it works instead of looking at the interface and the feature description from the vendor. We did the same things with Camtasia in this case. There are dozen of good things in this program. However, there are still things they need to update to make it the best all-in-one screen recording software at present time. We’ll keep these ideas at the pros and cons of this article. Let’s quickly go through how to work with Camtasia now. Camtasia screen recorder has been known as one of the most powerful video recording program in the world for years. It is simple to use yet powerful enough for creating professional screencast videos at high quality level. Camtasia screen recorder let you record anything from your computer screen with your webcam, audio from microphone in different modes i.e full screen, a fixed region or a locked application. There are other settings about the hotkeys, output resolutions, mouse cursor, real-time annotation tools you can customize on your own too. 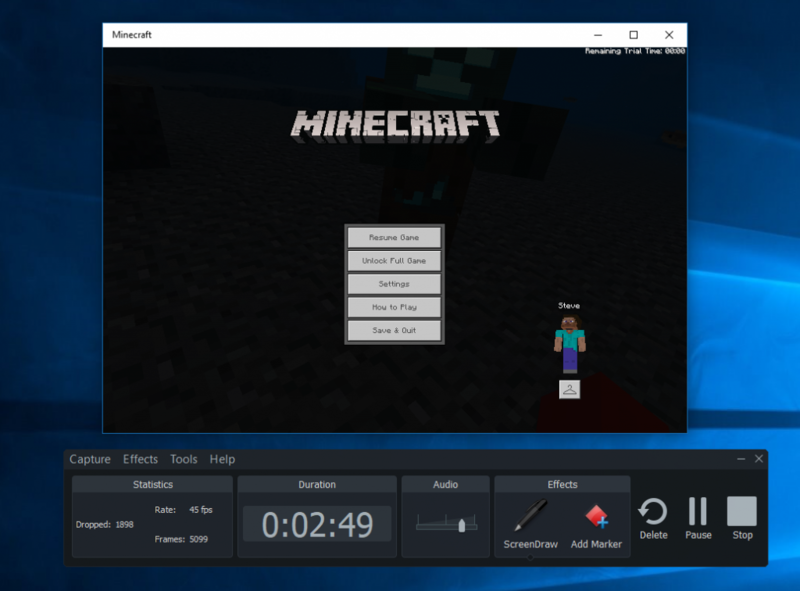 We’ve tested Camtasia screen recorder in various scenarios such as record 20 minutes Minecraft game as well as record a complete tutorial on how to use a software and a website etc. Everything works fine. The program can do as what they promise. So there is nothing to complain about Camtasia screen recorder now. If we find out any bug during our test, we’ll keep you informed. Here is the screenshot of the screen recorder to give you more ideas about it. Camtasia Video Editor: The most interesting part of Camtasia I think! Whether you start your work by creating a new project or start a new recording, once the process is finished, you’ll be redirected to Camtasia video editor. That’s how the program works. It’s slightly different from other simple recording tools, but similar to a powerful all-in-one program we’ve reviewed recently, ActivePresenter. Frankly speaking, such kind of process will take more time to finish the project because of the encoding work at the later steps. However, you’ll have more chances to edit your recorded videos and add more explanations too. If you have prior video editing experience, you’ll easily recognize that Camtasia video editor looks very much similar to popular professional video editing program on the market now such as Filmora video editor or Magix Vegas Pro. So, that’s it! It is a classic timeline video editor with a preview window on the right side. Timeline tracks are at the bottom. 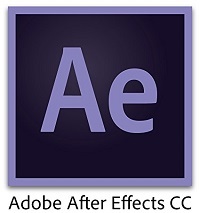 Video effects, audio effects, annotation tools, transitions an behaviors are closed to the Media bin. It looks a little bit user interface, but intuitive enough to get things done. When it comes to video editing, professionals often look at the advanced features of the program rather than just how easy-to-use or intuitive it is. We did go over all the advanced tools in Camtasia video editor and realize the fact that, Camtasia Video Editor is great at the purposes it is created for only. It is not an all-purpose video editing program for sure. Intuitive and simple to use classic timeline editor that anyone can learn easily. Flexible media bin to arrange your raw footage still images. Easy editing workflow with drag-n-drop actions. Simple to add transitions, video and audio effects to your clips. Has some unique and advanced tools such as color adjustment, noise removal, device frame, border, drop shadow and chroma key. Possible to add quizzes to Timeline (Some types of questions). Quite good video rendering speed with different quality (up to 1080p). Possible to share your project directly to TechSmith’s server (Screencast.com), YouTube, Vimeo, Google Drive. Great online support and tutorial resources: TechSmith has a good technical support team in my opinion. When I have something to ask, the answers are quite fast compare to others I’ve tested. TechSmith also produce useful video tutorials and upload them to YouTube very often. 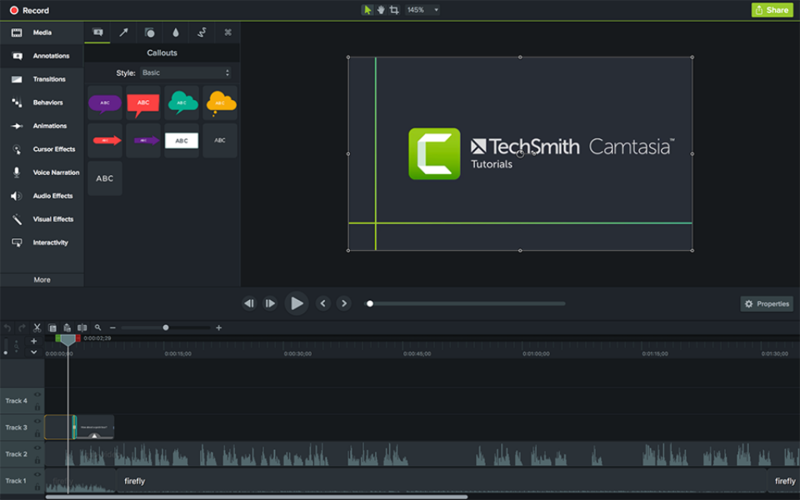 Simple to use yet powerful enough for specific purposes: TechSmith did a great job when created Camtasia smart and simple workflow for the purpose of creating online training videos, promotional marketing videos as well as tutorials. Great ready-to-use resources to help us to create video faster: We love all the ready-to-use annotations, call-outs, intro and outtros TechSmith offers in the new Camtasia 2018. Despite the fact that Camtasia 2018 can handle the work perfectly. However, we don’t think it’s worth $249 per license as there are many other cheaper video editing programs can do the same job. Yes, if the license price comes down to less than $200, we can say there is no Pros in Camtasia at all. No free version. Trial in 30 days only. Lack of advanced color grading and audio mixer tools. Do we recommend Camtasia 2018? It depends! If you are a personal user and you only want to produce some simple videos to upload to your YouTube channel, definitely no need to purchase Camtasia 2018. On the other hand, if you are a professional training video creator or educators, Camtasia 2018 is a good choice to go! If you have any other opinions about this program, don’t hesitate to share with us. Our comment section is open for discussion.